Last summer, on a flight between Chicago and Portland, I settled into my seat with book in hand, as was my common practice. Part way through the flight, the college-aged woman sitting next to me took notice of the book I was reading, and mentioned that her pastor knew the author of the book. I inquired about her church, family and life, and we exchanged thoughts on our favorite travels and music and film. She highly suggested several coffee shops, restaurants and venues in Portland, her hometown, as well as in Seattle, where she currently attended university. Because of my affinity for many things about the Pacific Northwest, I took notes of her suggestions in Portland and Seattle, as well as some of her film and music preferences. One artist she mentioned was of particular interest, a rapper — the young woman did not appear to be one who normally recommended urban music. As the plane landed and travelers departed for connection flights, the young woman and I wished well in each other’s endeavors. A few months later, my friend Caleb posted a web link to a music video of this artist, reminding me of the conversation. I clicked the link, watched the video, wondered at the rare and literate genius portrayed through hip hop rhymes, and immediately sensed the great discovery I had made. As I consumed additional music videos and created a Spotify playlist from a smattering of this artist’s body of work, it became apparent that this man spoke volumes of truth, passion, and vision through his music. Will I stand for change or stay in my box? I love that Macklemore is aware of this materialistic, identity-consuming bent — and he’s trying to escape it. Idols must be confronted and destroyed. 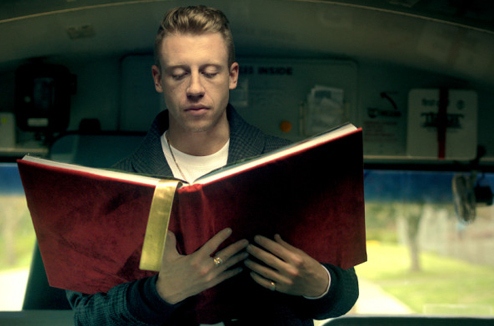 Bonus: In the video, it’s fantastic to see Mac holding a book in several cuts. He’s a master storyteller, and he knows it. But he just lets the stories speak for themselves, no self-promotion needed. What truths do you see in these lyrics? What places in culture, personal stories and industries do you see shadows of truth? Or do you have a hard time seeing truth in anything not explicitly “Christian”? It’s funny because Macklemore couldn’t be more opposed to Christianity. He says it in many of his songs. Keep listening.